40 Years After the Second Indochina War – Patrick F. Clarkin, Ph.D.
Today does not escape easily from yesterday. Several media outlets have published stories in the last few days marking the 40th anniversary of the ‘end’ of the Vietnam War (although it is more accurately known as the Second Indochina War because it also involved the neighboring countries of Laos, Cambodia, and Thailand). Some of these stories are about families of American veterans still searching for the remains of lost loved ones. Others are about the lingering divisions between northern and southern Vietnamese, even within the same family. Those two themes, that the war never truly ended, and that even those who survived and succeeded later in life have stories of loss and death, are important reminders of the past’s ability to reach into the present, even after forty years of yesterdays. All wars are unique, but their most consistent feature of war is the creation of suffering, which can last for decades, perhaps even centuries. There are several ways the war has had long-term effects. I’ll list three that deal with physical health. Map of U.S. bombing data in Vietnam and Laos. Source. (1) In Laos, Cambodia, and Vietnam, unexploded ordinance (UXO) continue to claim victims, despite the forty years that have passed since the official end of the wars (Laos’ part in the war officially ended in May of 1975, while in Cambodia and Vietnam this took place in April before subsequent conflicts began). (2) Another long-term effect is through the legacy of Agent Orange. In 1984-92, levels of dioxins found in different body tissues (fat, blood, breastmilk) were up to ten times higher in southern and central Vietnam – where the spraying of the defoliant was most concentrated – than in the north (Schecter et al 1995). Although it is difficult to prove a causal link, it is possible that elevated exposure to dioxins could lead to an increased risk for various cancers or birth defects (Schecter et al 1995). As recently as 2014, a follow-up study in Central Vietnam found that dioxins were still elevated in poultry, and above the maximum permissible limit, leaving the possibility of getting into human bodies via the food supply (Banout et al 2014). (3) Finally, another impact is the way that the war affected physical growth and development of people living in Laos during the war (Clarkin 2012). History shows that the war was very hard on civilians, with many people being killed or injured. Others were displaced by the conflict, some several times, forcing people to make long arduous journeys on foot for up to hundreds of miles. For example, one 37 year-old Hmong man I met revealed that he was displaced six times by the war, all before age 15. He was able to name each place he was forced to leave, and I estimated that these various journeys totaled at least 170 miles, as the crow flies. 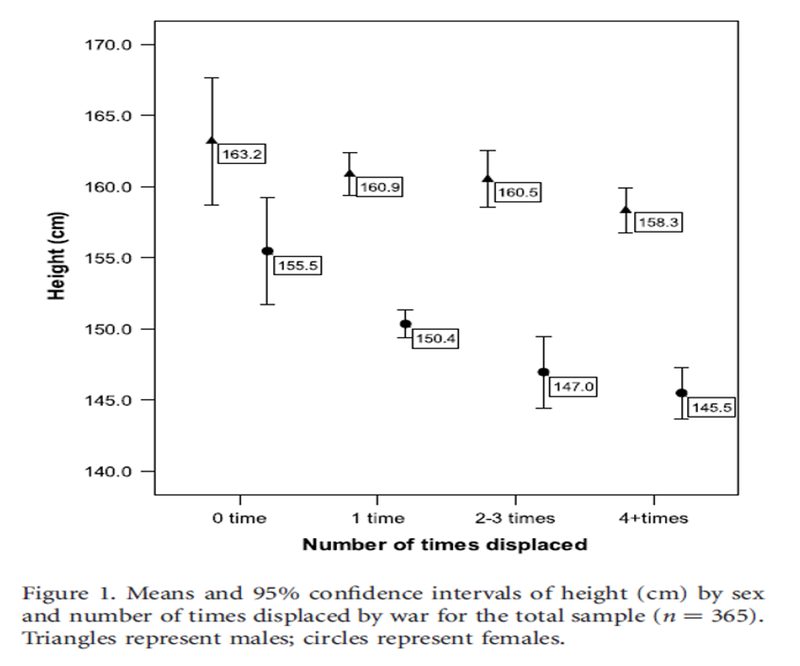 I found that the more times a person was displaced – most of which occurred during childhood or adolescence when they were still growing – the shorter they tended to be as adults. This was an imperfect correlation, as not all displacement events are equivalent (such as the duration or difficulty of the journey, age at which displacement occurred, level of security in place of refuge, etc.). However, it makes sense that children growing in an environment disrupted by war would not grow as well as they would in a more stable place. In a real sense, the experiences of war had become embodied in Hmong and Lao children, remaining there until adulthood. My guess is that similar patterns probably occur in most wars. Height of Laotian adults, by number of times they were displaced by war (Clarkin 2012). I don’t think it’s very helpful to define people exclusively by their traumas. I’ve written before that it is not an exaggeration to say that in many ways the war has not ended. But at the same time, I am also aware that people can be resilient. The various groups of people affected by the war – Vietnamese, Laotians, Cambodians, Americans, Thai, Filipinos, etc. – have made enormous efforts to seek reconciliation, justice, or somehow make peace with the past. For example, one 61 year-old man in Ho Chi Minh City, Luu Dinh Trieu, described his own experiences with being sent to a re-education camp after the war and suffering from discrimination because he had fought for the South. Eventually, he felt more accepted by society, suggesting that time can heal, though for him it took years. In some areas, healing is easier than others. Reconciliation, acceptance, and possibly justice are a matter of time and will. For other areas, such as altered or damaged bodies via UXO, chemical contamination, or stunted growth and development, the window of opportunity for optimal health can be permanently closed by war. That legacy can linger indefinitely. This entry was posted in Cambodia, Growth, Laos, Reconciliation, Second Indochina War, UXO, Vietnam, War and health and tagged ALP. Bookmark the permalink.